Altinex has released its TNP528 / TNP528C Tabletop Interconnect Boxes, two new additions to the ever-expanding line of Tilt ‘N Plug offerings. As a versatile interconnect device, the TNP528 is a hybrid solution with Digital (HDMI) and Analog (VGA) interconnects, as well as network and USB ports designed for mounting into tables, podiums, or other furniture as part of an AV presentation system. The TNP528 and its customizable sibling—the TNP528C—offer one touch access, making the tabletop connection point attractive for any boardroom or conference room table, the company says. The new TNP528 is UL / cUL certified for the highest standard of electrical safety. 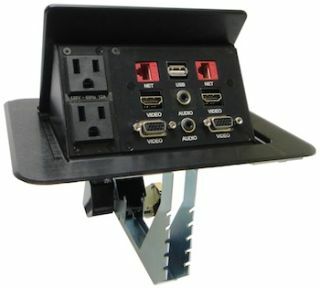 The standard TNP528’s pre-configured sectional plate (identified as the SP3501SC) contains one USB Type A, two VGA video, two HDMI, two 3.5 mm audio, and two RJ-45 CAT-6 network connectors. All connectors have 6 foot cables. To ensure easy access to power, the TNP528 and TNP528C both incorporate dual 12 Amp AC sockets. The Altinex TNP528C is the customizable tabletop interconnect version and can be outfitted with a wide range of available connector options—all factory-configured and terminated so installations are quick and effortless. While the standard TNP528 employs a black matte finish, the TNP528C is also available in brushed aluminum and the black Reflection Series mirror finishes. The TNP528’s input plate is accessed by pushing down on the top cover. The unit then auto-tilts open with assistance from an internal leaf spring mechanism. Once open, the input plate remains securely in place. The input plate is hidden, or closed, by pressing down on the top cover until the latching mechanism engages. In its closed position, the top panel lies flush with the table's top, held in place by the latching mechanism. This secure fit also means less chance for paperwork to catch the TNP528’s edges when being passed across a table. The Altinex TNP528 and TNP528C Tilt ‘N Plug interconnect boxes are available now with a MSRP price of $828 and $927 respectively. An additional charge applies when a Reflection Series cover/bezel is selected.